NYU Langone Medical Center's emergency room is back open 18 months after Superstorm Sandy shut it down. The facility was rebuilt to withstand future storms, according to officials at the reopening on Thursday. Gov. Andrew Cuomo and Mayor Bill de Blasio, who were on hand for the ceremony, praised the speedy reconstruction efforts. "This is clearly one of those moments where we can say to the world, 'This is what we are made of,' " de Blasio said. The floodwaters of the Oct. 29, 2012, storm destroyed generators, monitors and other equipment, forcing administrators and emergency workers to remove patients on stretchers through dark stairwells. The Ronald O. Perelman Center for Emergency Services is 22,000 square feet, three times the size of the older emergency department, and has 40 emergency care treatment spaces equipped with the latest medical technology. The new hospital section, which is expected to see 50,000 visits annually, also includes a pediatric emergency center. "Our mission is simple -- that everyone who comes here feels better when they leave and feels healthier when they leave," said Ken Langone, the chair of the hospital's board of trustees. The rebuilding efforts, funded by a $50 million grant by hospital trustee Ronald O. Perelman, also included infrastructure improvements to protect the medical facility from storms. The rebuilt department now boasts flood walls, and important equipment has been moved to higher floors. Cuomo applauded the efforts to stormproof the hospital. "We expect Mother Nature to revisit, but when she does, we will be prepared," he said. The governor added that the reopening sent an important message that New Yorkers' camaraderie can overcome everything. "Knock us down and we get up stronger," he said. "That is the New York way." The neighborhoods of the Queens peninsula — Breezy Point, Belle Harbor and Arverne — have seen varying results when it comes to recovery, according to Jonathan Gaska, district manager of Community Board 14. The majority of homes that have not been rebuilt are in Breezy Point, where 100 houses went up in flames. Those who signed up for the city’s Build It Back program, which offers financial assistance for home repair, are largely still waiting for the funds. More than 7 feet of water flooded the lower Manhattan neighborhood, shutting down businesses. Catherine McVay Hughes, the chair of Manhattan’s Community Board 1, said independent stores quickly banded together and most reopened their doors within the first year following the storm. McVay Hughes was in Albany this week to discuss Sandy recovery efforts with state officials and said she raised concerns that money isn’t coming in fast enough to the victims. “We can’t keep waiting, and have to keep the pressure on the federal government to deliver those funds,” she said. Councilman Mark Treyger, who represents the area, said residents have lost patience when it comes to recovery. The councilman said affected homeowners aren’t getting accurate information from the city. He noted that Coney Island, Seagate and Brighton Beach residents who live in co-ops and other apartment buildings had no idea they were eligible for aid. Borough residents who live in neighborhoods such as Oakwood Beach, Ocean Breeze and New Dorp Beach are also reeling from the Build It Back roadblocks, but there has been some relief. The state bought more than 700 homes in Oakwood Beach and Ocean Breeze that were affected by the storm and it is considering opening up the buyback to other neighborhoods as well. This week, the NY Rising Community Reconstruction program awarded an additional $3 million in funding for projects that will stormproof parts of the borough. Although the site is open daily to visitors , half of the former immigration-processing center is off limits due to ongoing Sandy repairs. Mindy Rambo, a spokeswoman for the National Park Service, which manages the island, said the floors that house its artifacts need special AC and heating units. 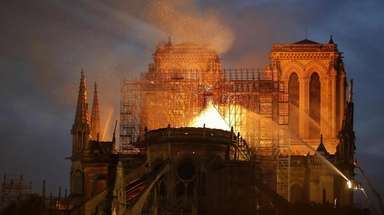 “Until those are repaired, the delicate historical items can't be returned because they have to be in a certain temperature and humidity,” she said. Construction on the five miles of boardwalk will begin next week, and the city’s parks department said it will be opening it up in sections over the next few years. Liam Kavanagh, a first deputy parks commissioner, said the boardwalk will be concrete instead of wood to ensure it withstands future storms. What’s more, the boardwalk supports will be steel rather than concrete. “It is something we think will be there for the long haul,” he said. The Montague tunnel, which connects the R train between Brooklyn and Manhattan, will continue be closed until October while MTA crews repair the Sandy damage. And the work won't end there. Earlier this month, the agency announced that it will shut down the Cranberry tunnel, which connects the A and C lines between the two boroughs, and the Rutgers tunnel, which connects the F line between Brooklyn and Manhattan, sometime after work on the Montague tunnel is done. Although no timetable is set for the repairs, the MTA said work will only be on weekends.